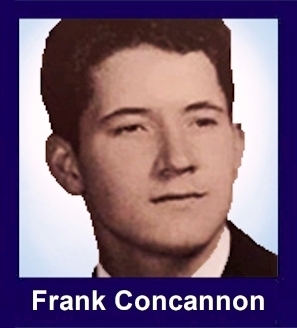 The 35th Infantry Regiment Association salutes our fallen brother, PFC Francis Bryant Concannon, who died in the service of his country on March 11th, 1967 in Pleiku Province, Vietnam. The cause of death was listed as Enemy Grenade. At the time of his death Francis was 19 years of age. He was from Forestville, Maryland. Francis is honored on the Vietnam Veterans Memorial at Panel 16E, Line 060. The decorations earned by PFC Francis Bryant Concannon include: the Combat Infantryman Badge, the Bronze Star with V, the Purple Heart, the National Defense Service Medal, the Vietnam Service Medal, the Vietnam Campaign Medal and the Vietnam Cross of Gallantry with Palm Unit Citation. PFC Concannon had worked at his father's service station in Largo, MD and would have become a partner upon his discharge from the Army. He was also planning to be married then to Darlene Macgruder of Camp Springs, MD. They had become engaged shortly before he left for Vietnam. PFC Concannon attended Prince George's Elementary School and graduated in 1965 from Suitland High School. Prior to Vietnam, Concannon took Basic Training at Fort Bragg, NC and Leadership Training at Fort Jackson, SC. He was a former Boy Scout and a lifetime member of the East Washington Heights Baptist Church. He is survived by his parents Mr. and Mrs. Martin J Concannon; a brother Martin J Concannon Jr. who already has served with the Army in Vietnam; and a sister Dorothy Mae Concannon; all of 8409 82nd Ave, North Forestville. Also surviving is a grandfather, Richard Bryant Sr. of White Stone, VA.